Baltimore Police Caught Planting Drugs In Body-Cam Footage, Public Defender Says : The Two-Way The officer has been suspended and two others are on administrative duty, Baltimore Police say. The public defender's office is questioning the officer's involvement in 53 active cases. Body camera footage of a Baltimore police operation released by the public defender's office appears to show an officer hiding drugs and later discovering them. A Baltimore man was held in jail for months after police found a stash of drugs — but the officer who found the drugs also seems to be the one who hid them in that spot, according to footage from his body camera. The public defender's office says the man is now free and it is questioning the officer's involvement in 53 active cases. The officer has been suspended and two of his colleagues are on administrative duty, Baltimore Police Commissioner Kevin Davis said, as the agency's internal affairs unit looks at the case. The recording is from the afternoon of Jan. 24, when the officer, Richard Pinheiro, was standing in the trash-strewn backyard of a row house along with two other officers. At the start of the footage, Pinheiro is seen holding a soup can with a clear plastic bag stuffed into it. He then places the can among rubbish, before leading the other officers out of the narrow access alley. On the sidewalk, Pinheiro activates his body-cam — apparently unaware that the device would also preserve his earlier actions. "Police cameras have a feature that saves the 30 seconds of video before activation, but without audio," The Baltimore Sun reports. "I'm gonna go check here, hold on," the officer tells his colleagues, walking back to the property — and seeming to spark laughter from his fellow officers. After a "search" that lasts about 15 seconds, he picks up the soup can, pulls out the plastic bag and displays it to the camera, showing that it's holding white capsules. "Yo," he yells. "Hold up." The operation resulted in an arrest and months of jail time for the suspect, who wasn't released until the public defender's office sent the body-cam video to the state attorney's office last week. He was held while unable to post $50,000 bail, the Sun reports. The public defender's office says that despite the prosecutor's claims of being "appalled" by the incident, "Officer Pinheiro was called to testify in another case the following week without any disclosure of this videotape." The office says Pinheiro is named as a witness in some 53 active cases. Baltimore Police say they're investigating the accusation that the officer planted evidence, after being informed by the state attorney's office. "This is a serious allegation of police misconduct," Davis said. "There is nothing that deteriorates the trust of any community more than thinking for one second that uniformed police officers, or police officers in general, would plant evidence of crimes on citizens." At a briefing Wednesday, Baltimore police officials provided more details from the January police operation, saying the officers had been watching a man they believed to be selling heroin that he was storing in a yard in the alley. Laying out a timeline from that day, Deputy Commissioner Jason Johnson said that before the search, police separately stopped and questioned two suspects who they believed to be the buyer and seller of heroin. Both were found to be in possession of drugs, Johnson said. Johnson played several videos related to the operation, depicting at least one other search of the backyard where officers suspected the seller was keeping a cache of drugs. He said the video showed officers finding a knotted bag of 25 heroin capsules — and agreeing that there would likely be another bag nearby that was already open. 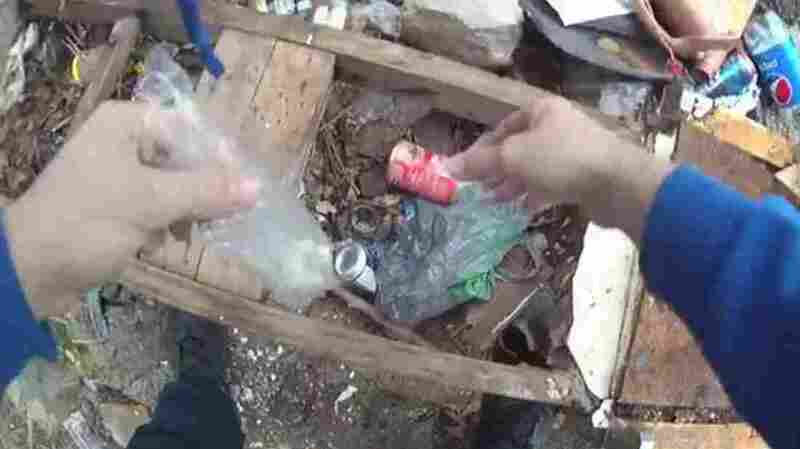 After replaying the video highlighted by the defender's office, of what looks to be a staged search, Johnson said, "I think it's fair to say that the video purports to be the first discovery of that second bag containing heroin — but it's clear that it's not in fact the first discovery of that particular bag." Johnson and Davis said the investigation will focus on learning why the officers would have staged the discovery. "I'm not saying that there was a re-creation of the discovery of the drugs," Davis said. He later added, "But it's certainly a possibility that we're looking into, to see if the officers in fact replaced drugs that they had already discovered, in order to document their discovery with their body-worn cameras on." He added that the investigation will take time. "We have not reached any conclusions," Davis said, adding that the video that was initially released doesn't tell the whole story. He also said he is proud that the department has deployed more than 1,500 body cameras. Noting the Baltimore Police Department's recent history of problems — which prompted a scathing Justice Department report last summer — Debbie Katz Levi, head of the Baltimore Public Defender's Special Litigation Section, said, "We have long supported the use of police body cameras to help identify police misconduct, but such footage is meaningless if prosecutors continue to rely on these officers, especially if they do so without disclosing their bad acts." Calling for police accountability, Katz added, "Officers should not be able to decide when to turn the cameras on and off."